These lines are part of a play written and performed by Iraqi Christians to remember what happened after the self-proclaimed Islamic State seized their northern town of Qaraqosh, then Iraq’s largest Christian settlement. 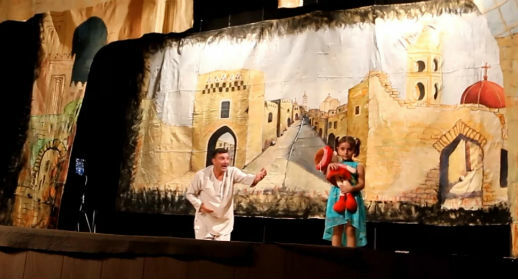 Performed initially in the Iraqi Kurdish capital on the first anniversary of the invasion, the play has since been performed for Iraqi refugees in Lebanon, too. The entire production was written and acted by internally displaced people living in Erbil, capital of Iraq’s autonomous Kurdistan region, who remained hopeful of returning home one day – even though it’s now the second anniversary of Qaraqosh’s takeover. On the morning of 6 Aug., 2014, IS first shelled and then captured the town, killing several people. The seizure of Qaraqosh, only weeks after about 1,000 Christian families escaped from Mosul, led to the second-largest number of displaced Christians recently – the two combined were the largest sudden displacement of Iraqi Christians in modern history. The play also touched on the many hardships Iraqi Christians have endured over the past decade. “They don’t need actors, because they are from Qaraqosh themselves,” said one spectator. The play starts with ominous music and red light – a threatening mood. Masked men, dressed in black, carry in someone wrapped in a blood-stained piece of cloth. Suddenly the ‘militants’ disappear; lights come on. Moshtak – scared and confused, crawls out from underneath the cloth: holding it with disgust, he realises that Islamic State has come to his city. The next act begins with peaceful music; a young girl skips around in circles with her doll. The music gets louder, Moshtak stands up. A young girl appears in a blood-stained dress. Moshtak, stunned, at first does nothing, then says: “Christina, where have you been, beautiful? Your mother is looking for you. She looked for you everywhere. Where did they take you, beautiful?” The girl continues to wander, then stops and looks out with a serious expression. The music becomes disturbing again with the return of Islamic State militants. Suddenly the doll drops and the young girl disappears. The play concludes with a sense of hope. The last act reflects Palm Sunday, an annual highlight for the residents of Qaraqosh, when they would go out on the streets, to sing and wave olive-tree branches together. As Moshtak started singing – “Long is the road, indeed long, and covered in blood. But we shall carry olive branches until the Resurrection” – many in the audience stood up and joined him. And his hopeful ending of ‘Hosanna’ was celebrated by roaring applause from the audience. One spectator said they found the play very moving.